The Wilson K Factor K Sting FX Squash Racket is not only stylish and functional, it also features the brand new FX design. This is the next generation of Wilson’s [K] Factor Squash rackets, utilising an innovative Quad Shaft Frame Geometry that provides increased stability by distributing weight to 4 pillars instead of 2. This creates 23% more torsional stability with a greater concentration of weight in the throat area. In short, the throat of the racket is no longer a solid beam but a split shaft, adding a new performance and reduces twisting in every shot. The Wilson K Sting FX Squash Racket combines stability and power with new FX technology to provide players with a game winning racket. A tighter string pattern enhances power delivery providing you with the means to subdue any opponent out on court. FX is the next generation of Wilson’s [K] Factor Squash rackets, utilising an innovative Quad Shaft Frame Geometry that provides increased stability by distributing weight to 4 pillars instead of 2. This creates 23% more torsional stability with a greater concentration of weight in the throat area. The Wilson K Sting FX squash racket features the [K]arophite Black material in the frame, which is Wilson’s propriety next generation structure which makes use of nanoscopic technology to produce more feel, strength and stability. Add to this the [K] Zone, which utilises Power string holes and Power Groove Technology, and the net result, is a greater string bed compression and flexibility making for a larger sweet spot. This adds more power and forgiveness, even on off centre shots. The [K]ontour Yoke enhances stiffness at key stress points on the racket for improved torsional stability, while the [K]ontour frame features a new industrial design innovation that improves handling, manoeuvrability and feel. 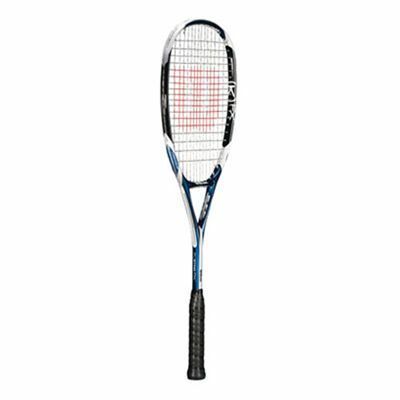 for submitting product review about Wilson K Sting FX Squash Racket.